Living the Sydney life with a job! 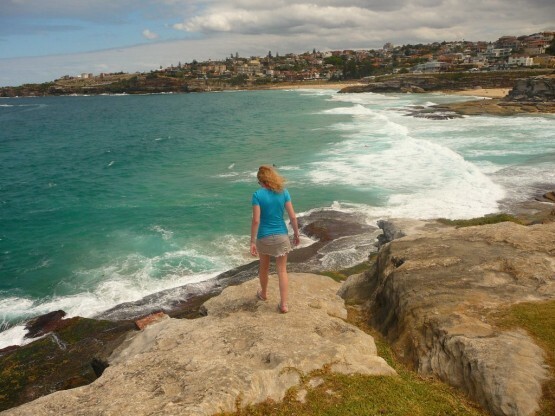 Jenny fills us in on her second week of work in Sydney- thanks Jenny! After much CV dropping and applying online for jobs, in my second week I managed to get 3 different interviews. The first was a trial at Café Bondi, a small Café and Restaurant in the Bondi Beach area, the second was an office job for a charity in the City and then a second trial at a Café and Bar in the City. Out of the 3 I was luckily successful with the third! I had my trial in the middle of the second week and by the end of the trial I was asked to come back and am now fully employed, a great success! I work at Café Courtyard, a buzzing place right in the city centre amongst the skyscrapers, great shops and a 10 minute walk to the Harbour. It is a Café and Restaurant where Business Men and Women take their coffee and lunch breaks so there is a sense that I really am a part of this city. It is a great place to work, great people (nearly all Brits like me on their travels! ), and I get great hours that will help pay my rent, help me save up for further travel and allow me to have a great time while here in Sydney! Unfortunately, because I grabbed this job and they asked me to work for the following few days, it meant I missed out on the last couple of trips, I missed the canoeing and the trip to the Blue Mountains but the aim was to get a job, and that to me was more important. I am so pleased that I have a job and that Sydney is now mine to enjoy, I have met some good people at work who I hope to make great friends with, I don’t have to worry about money running out and can enjoy everything the city has to offer, and it has A LOT to offer. Next Post The great gap year conundrum: why pay to volunteer? Do you think someone on absolutely limited minimum funds could manage to come out without much cash and survive? I’m thinking of doing it but I have no real savings and will have to be working as soon as possible, everything will be on the cheap etc and I’ll also have to send home £160 per month. Is it even feasable, is there much difference living on the cheap here in the uk as to living on the cheap over there? You can live in Sydney on limited funds… however to be eligible for the working visa you do need to have a certain amount of money in your bank account- this amount is stipulated to be having enough money to support yourself for your stay ie. up until you get a job. This means that you would need a bit of savings to be able to do it but when the wages start coming in you would be able to live on the cheap and be able to send money home too. There is very little difference between living on the cheap in Sydney to in London (but obviously bigger cities are more expensive than if you took a job outside of Sydney for example). There are jobs available outside of Sydney too, and these are available a lot more readily and you will probably be able to save a bit more money out tehre. How fast do people that really put the effort in tend to find jobs, I’m a call centre worker over here with various additional skills with a great telesales background, from reading about average shared rent and actual wages I see it being beneficial for me it’s just that initial fear of finding work. Hi Simon. If you really put the effort in it is possible to have a job secured in the first two week period- especially if you are flexible and dedicated to the job hunt. This is not guaranteed, but there are some great employment opportunities out there and there is a database of employers that will go directly to you if they are recruiting at that time. It’s really nice to read your story, it helps giving me the push I need to get out of here. Don’t give up on your search! If you are interested in getting away for a while and doing any volunteering placements, then we would be delighted to help, however unfortunately we won’t be able to help you to get set up and moved out to Sydney. What about with an Australian Work Visa? To do an Oyster program the Working Holiday Visa is mandatory? There are no other options? To get an Australian work visa you need to be sponsored by a company. To do a working placement over in Australia, you do need to have the working holiday visa, which allows for you to work in Oz for up to one year. If the company you currently work for is an international firm with offices in Australia, they might be able to sponsor you to work out there. OK, thanks for your help Anne! Have a good nice day! You too, best of luck! By the way, I’m sorry Anne, I misunderstood… I now realised that this was Jenny’s testimony, but my doubts remain.